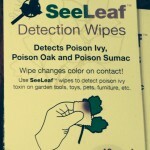 SeeLeaf detects poison ivy, poison oak and poison sumac. Please note that we charge $2.50 for standard shipping and handling for simple orders. USPS Priority Mail Express costs $27.50 and takes 1-2 days delivery depending on location. If you are ordering in bulk, we will contact you for possible additional charges (and we’ll keep it as low as possible! ).